It’s a good problem to have: Cash accumulating in a checking account, a savings account, or a brokerage account. It could be from bonuses, commissions, dividends from company stock. Or it could be you just doing a good job of living below your means, with the result being that what you don’t spend accumulates in one of the aforementioned accounts. The Challenge: What should you do with it? It’s just sitting there not earning any interest, or it’s earning interest at a rate that is a rounding error. That’s why I like this graph I came across from Fidelity. When you assign tasks/goals to your cash, it provides a framework for what you want to accomplish with it. A vacation? A new vehicle? Buffer in case all heck breaks loose? Peace of mind? 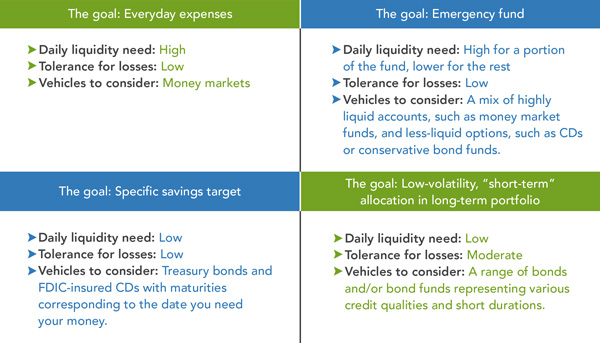 These are some of the goals you can assign to cash, making it clearer to assign different fixed income (e.g. 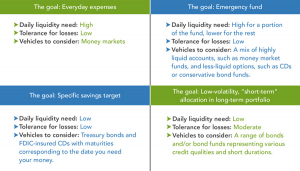 CDs, money market funds, bonds) to the goal. A significant benefit to assigning goals to your cash is that you then have less of a proclivity to impulsively spend it, because it’s already assigned to a goal. That’s how you put up a self imposed barrier against your behavioral finance self that sometimes breaks free against your better judgement, causing you (all of us) to spend money in ways you didn’t plan to. Is this throwing cold water on the fun we experience with impulsive buys? It’ not meant to. It’s meant to provide purpose and meaning to the short– medium term cash we have and to keep us from jeopardizing that cash’s respective goals. (Disclosure: I have personal accounts with Fidelity as well as other broker-dealers. ).